Three graffiti artists died while they hid from an oncoming train in south London, a coroner has found. Alberto Fresneda Carrasco, 19, and 23-year-olds Jack Gilbert and Harrison Scott-Hood were hit on tracks near Loughborough Junction station in the early hours of 18 June. A detective said the friends would have seen the train coming but could not have known which rail it was on. Their deaths were recorded as an accident. Senior Coroner Andrew Harris told Southwark Coroner's Court the men scaled a fence to trespass on the track at about 00:25. "They were walking along a track which is subject to extensive graffiti. Unknown to them, they were facing an oncoming train," he said. "They hid by a wall but were struck by a train." Det Sgt Simon Rees, who led the investigation into their deaths, said it was "completely pitch black" on the largely moonless night, but they would have seen the train's lights coming towards them. "My view is it's impossible to know what rail it was on and I believe their first instinct was to conceal themselves because they wanted to go on to create artwork," he told the court. "It is likely... they dropped down behind a wall so they were not seen," he added. "Unfortunately they had already put themselves in harm's way." The train driver said his shift had been "uneventful" and did not realise there had been an impact, which occurred between Denmark Hill and Brixton. Mr Gilbert's mother Maxine said she thought her son, an events inspector from Enfield, north London, only sprayed on legal walls. The last thing he told her was: "I'm going out painting, love you lots." In a statement read to court, she said the "gorgeous, bright, cheeky, inquisitive boy brought everyone joy". Mr Scott-Hood's mother Susie Hood said her son, a chef who lived in Muswell Hill, north London, was a "creative, free-spirited young man" who criticised the "stigma" surrounding graffiti. Mr Fresneda was a New York City-born student who lived in Hampstead, north London. His mother Isabel Carrasco said: "We just wish he could've fulfilled his dreams." 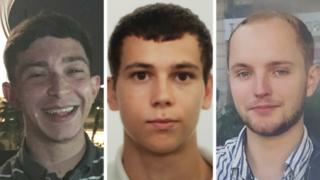 A joint statement from the families said the three friends "tragically lost their lives because of the dangerous risks this art form brings". "Their passion is what brought our boys together," the statement added. "If our sons were guilty of anything, it was their love for painting. We can only express to young people trying to make their mark to please be safe." The families closed the statement with: "Rest In Paint."